Upon entering Wade Thompson Drill Hall at the Park Avenue Armory in NYC late this afternoon, I was struck by the dramatic quality of the lighting and staging of Ann Hamilton’s multisensory large-scale installation titled the event of a thread. With spotlights on the immense, billowing white cloth/curtain in the center of the hall, it’s hard not to feel that you’ve entered into some sort of theatrical performance. 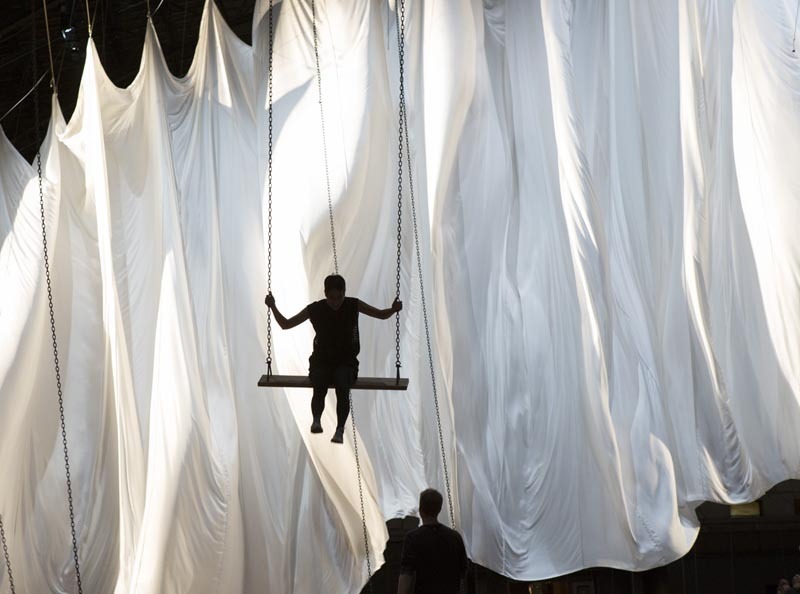 But the curtain is at the center of the “stage” suspended by ropes and pulleys, with all its movements attributed to the field of swings indirectly connected to it. The silky white cloth undulates as the swings’ velocities increase and decrease through the collective action of the swingers (aka the exhibition visitors.) There are bells that ring periodically, and harmonica-sounding noises all seemingly controlled by the swings. At the western end of the large hall, two people sit, surrounded by cages of homing pigeons, taking turns reading — at times reading in unison — philosophical phrases in a soft-sounding, almost whispery, tone that is heard through a series of speakers in paper bags throughout the hall’s floor. On the other end, a writer (Ann Hamilton herself, when I was there) sits with her back to the hall, viewing it only through a mirror, and responding through letters to the sounds and movements behind her. Oh, and the swings! Very fun and surprisingly, for me, not dizzying. Maybe it’s their very long chains that account for the slow and relaxing movement. It’s hard to describe the soothing quality of the experience. Though entirely different in look, and much more low-tech in comparison, I had a very similar pleasant sensation swinging in the event of a thread as I did lying down in Ryoji Ikeda’s very electronic The Transfinite a year and a half ago in the same hall. It might, in part, be the space, or possibly the familiar dinging sounds, or it might just be the forced disconnection for an hour or two from computers, phones and the busy NYC streets. Maybe this is what yoga is like —I know, shame on me for never having tried it — but whatever the reason, the event of a thread is worth a visit. It will likely be even more fun this Saturday when it’s sure to be more crowded making the interaction between swings that much more evident. And I almost forgot Emma’s favorite part: the pigeons! Starting next week (apparently they’re still new to the space and a bit intimidated) at the end of each day’s event (at 6:45pm) the pigeons will be released from their cages and they will fly across the hall to their large nighttime metal cage that hangs high up from the hall’s iron trusses on the other end, while a different singer will sing each evening. And the opposite will take place each day at noon in the other direction as the exhibit opens for the day. 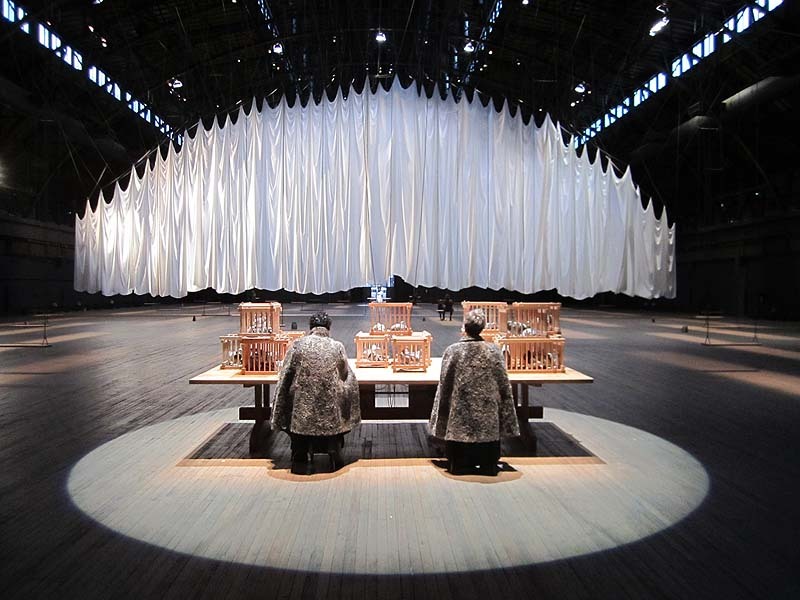 The event of a thread will be at the Park Avenue Armory for the next month through January 6th. This Saturday, December 8th, admission will be free, otherwise it’s $12 for adults. Top photo by James Ewing courtesy Park Avenue Armory. All others collabcubed. This entry was posted in Art, Event, Fun, Just Plain Cool, NYC, Stuff We Like. Bookmark the permalink. I know we both will love it. There’s was a child there when I went and she seemed into the swings…I know, shocking!